You can access this area by clicking on the user icon at the top right corner of the screen. This last division of the dashboard is where you'll manage everything related your Snipcart account. Before using Snipcart in live mode, you'll need to define your business information. Simply complete standard fields. If you're a new Snipcart merchant, don't mark the checkbox under Preferences. This option allows merchants to keep existing our old format of CSV exports. ​ Under Account > Profile, in Live mode, you have the option to import settings from Test mode. ​ ​ For a typical Snipcart integration, you'd start by setting your online store & website (configuring taxes, shipping, etc.) in Test mode. Once you're ready to go Live, you'd toggle the Live mode using the button in the header of the dashboard and copy your Live API key on your website. Then, you'd have to go through all the settings and enter them again. ​ To save yourself some time, you can use the Import settings from Test mode button to import each setting defined in Test mode to your Live mode. Be careful, it may override your actual Live settings.. This section will be used to manage both your public and secret API keys. 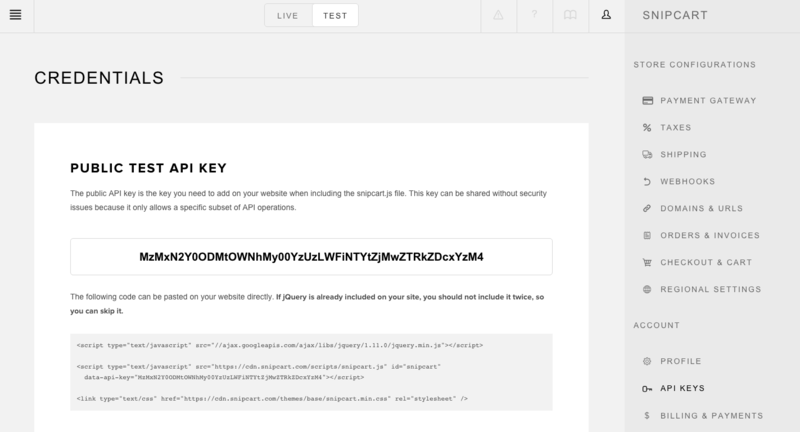 Whether you're in test or live mode, this is where you'll find your API key. It's already included in the code snippet you need to inject on your website to integrate Snipcart. 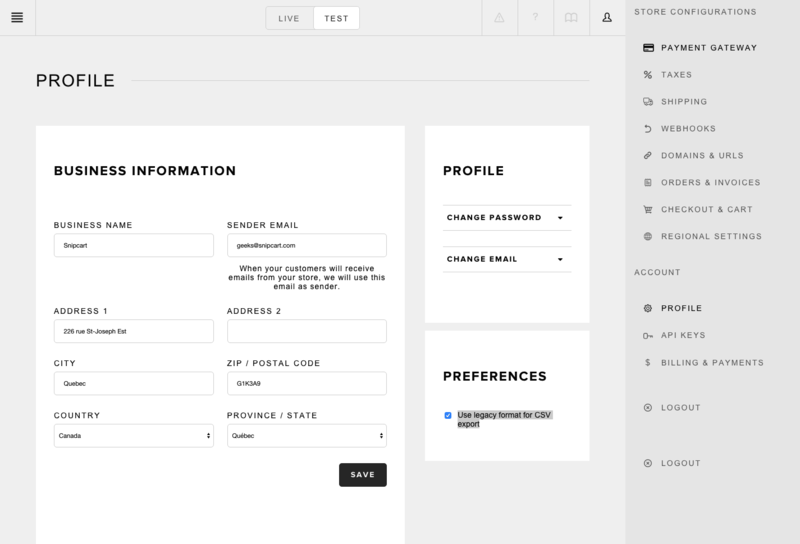 Please see the Live/Test environments section for important details. You can refer to the Getting started section to learn how to integrate Snipcart on your website. You'll find this area just beneath the Public API key section. Secret API keys are used to access all the data of your Snipcart account. They should never be accessible nor visible to anyone without proper authorization. Do not use them for your website's public key. These secret keys give access to our RESTful API. When you want to allow an application to use your Snipcart data, create a secret API for this specific third part. You will be able to revoke this access at any time afterward. This section is where you'll manage the billing details for your Snipcart account. Front and center here are an overview of your sales since your last bill, your upcoming monthly fee and your next billing date. 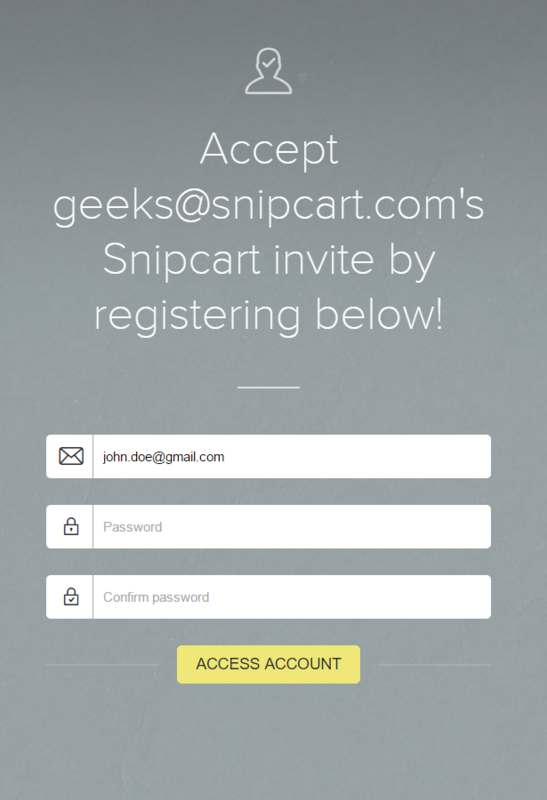 This is also where you'll enter your required payment information (credit card) details for your Snipcart account. 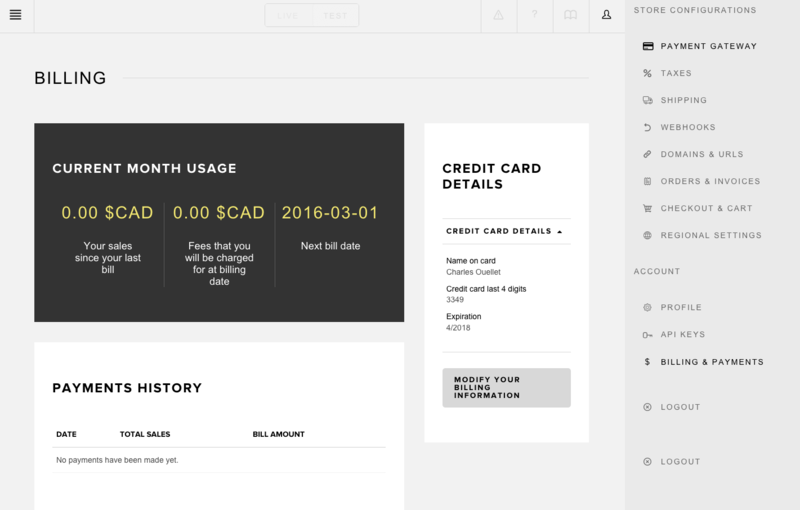 Before connecting a gateway to your online store, you'll be prompted to this section to enter your own payment info. A history of your previous Snipcart fees is also available here. In this section, you can manage the different users who have access to your Snipcart account. Note that the first email associated with your Snipcart account will remain tagged as "Admin", and that you will not be able to delete it from the account. All other subsequent users can be removed from the account at any time. Just use the small trash can next to their email addresses to do so.